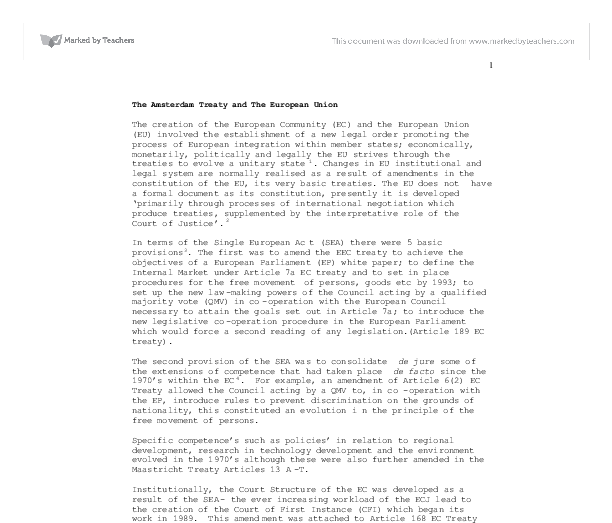 The Amsterdam Treaty and The European Union The creation of the European Community (EC) and the European Union (EU) involved the establishment of a new legal order promoting the process of European integration within member states; economically, monetarily, politically and legally the EU strives through the treaties to evolve a unitary state1. Changes in EU institutional and legal system are normally realised as a result of amendments in the constitution of the EU, its very basic treaties. The EU does not have a formal document as its constitution, presently it is developed 'primarily through processes of international negotiation which produce treaties, supplemented by the interpretative role of the Court of Justice'.2 In terms of the Single European Act (SEA) there were 5 basic provisions3. The first was to amend the EEC treaty to achieve the objectives of a European Parliament (EP) white paper; to define the Internal Market under Article 7a EC treaty and to set in place procedures for the free movement of persons, goods etc by 1993; to set up the new law-making powers of the Council acting by a qualified majority vote (QMV) in co-operation with the European Council necessary to attain the goals set out in Article 7a; to introduce the new legislative co-operation procedure in the European Parliament which would force a second reading of any legislation. (Article 189 EC treaty). The second provision of the SEA was to consolidate de jure some of the extensions of competence that had taken place de facto since the 1970's within the EC4. For example, an amendment of Article 6(2) ...read more. intentions to take full account of the social dimension of the EC in implementing the SEA.15 Although the SEA provided for progressive realisation of the European Monetary Union (EMU), the Intergovernmental Conference (IGC) led to Chancellor Kohl declaring in 1990 the need for a 'political union where significant competence of economic and democratic decision-making was lost to an increasingly democratic input at community level'.16 The objectives of the TEU included 'establishing the EU, and amending and further expanding the scope of the EEC Treaty, renaming the EEC the EC'17; this was done through creating a three pillar structure within Europe giving a 'single legal framework for the three European Communities' to achieve further integration18 and adding two other pillars to the EU. The first pillar comprised the EC, EURATOM and ECSC now known as the EU, a supranational body under Article A of the TEU. The other pillars were concentrated on the Common Foreign and Security Policy (CFSP) and co-operation in the field of Justice and Home Affairs (JHA), these new competences were legislated under Title VI TEU and are intergovernmental in nature, they, "Covered areas which are sensitive to national sovereignty, where the member states have wished a lower degree of political integration"19 The TEU brought the concept of an 'ever closer union among the peoples of Europe',the principle of subsidiarity and legislative 'simplification'20 The other pre-cursors of the TEU included citizenship within the union and the non-justiciable guarantee of the protection of fundamental rights ,to respect the national identities of the constituent states21, trans-European networks, visa policy for the crossing ...read more. However, the Treaty has shortcomings; politically, it has failed to deal with the unavoidable issue of the Accession of other member states- the question of the size of the Commission pending enlargement has been ignored.29 Also, the derogation of the UK, Ireland and Denmark over free movement weakens the integrity of the EU and confuses the citizen.30 Thirdly, the retention of the unanimity vote for too many decisions hampers the interinstitutional effectiveness brought by the Qualified Majority Vote. Politically, the endless debate concerning the reweighting of votes and the number of Commissioners restricted any developments in this area.31 The issues and content of the Amsterdam Treaty were overshadowed by simultaneous debates on the EMU, the mass media coverage of some issues playing down the achievements of this Treaty. Therefore, can the enlargement of the EU be anticipated without apprehension? It is true to say that the third large scale revision of the treaties has significantly amended the institutions, in an effort to prepare for the accession of other countries. However, perhaps what is significant about this treaty is the impetus on respect for human rights and serious implications if a member state breaches the ECHR. It is unfeasible to expect the accession of states such as Turkey, Cyprus and Yugoslavia with their abuse of these fundamental rights into the 21st century. Once the Amsterdam Treaty comes into force the significant legislative, political and social resolutions made will truly bring the 'citizen closer to Europe', simplify the legislative procedures of the EU through a wider adoption of the QMV and the co-decision procedure, perhaps it will also promote the integration of member states sovereignty to a further extent within the EU. ...read more. 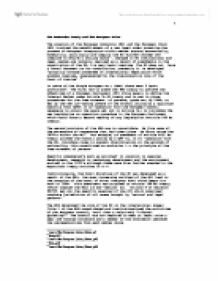 The European Investment Bank and the European Central Bank The European Investment Bank, the financial institution of the European Union, was set up by the Treaty of Rome in 1958 to finance investments in support of the Union's objectives. The EIB has legal personality and is financially independent. that trade and investment flows should benefit people at large and not just international business29. This has led to calls for a 'social clause' (especially initiated by EC) in WTO rules which would allow trade barriers to be invoked against imports from countries deemed to violate minimum labor standards. At that point there will probably have been some major changes to the EU as well as to Turkey. At this point of time the EU is weak at some issues like the Common Agricultural Policy which is taking up to much of the budget, and the CFSP which hardly exists. James Callaghan renegotiated Britain's membership to the EEC although not all were convinced of its merits. In June 1975 Britain held a referendum on EU maintaining EU membership and Prime Minister Harold Wilson waived collective responsibility within his Labour Party due to the controversial nature of the vote. European citizenship, on this view (still quite prevalent) is to people, what EMU is to currencies. To some -- both Europhiles and Euroskeptics -- this is exactly what European Citizenship is about. It should not surprise us that both Europhiles and Euroskeptics can hold a similar view of what European Citizenship is about. Thereby bring about the transfer of legislative procedure and limitation of their (sovereignty) of these states in matters related to such field4. The success recorded under this arrangement led to the negotiation to establish more institution to administer key sectors of their economy.